Cloud video encoding and workflows is growing by almost every measure. To quantify such changes, Encoding.com, completed and just released a survey, which provides a snapshot of the media’s use of cloud processing. The data set was based on responses from more than 3000 broadcasters and content publishers, all Encoding.com customers. While this represents only one cloud provider, the results provide insights that may help media managers develop their own media processing strategy. Measured against 2015, encoding volume grew by 63%. With 14 processing centers located across the world, the survey data represents virtually all markets. The following report is based on those markets’ responses. HLS (HTTP Live Streaming) is an adaptive streaming communications protocol created by Apple and works with iOS and Apple TV devices and Macs running OSX in Snow Leopard or later. HLS can distribute both live and on-demand files. Because it is the sole technology available for adaptively streaming to Apple devices, HLS is an increasingly important market segment for streaming publishers. ● For the first time since 2008, the average number output formats decreased from 12 to 10. At the same time, content publishers are mapping the HLS output to a broader set of consumer devices. One of the biggest trends driving cloud growth is the adoption of cloud resources by the world’s largest media and entertainment companies. A few critical elements have made these companies more comfortable using the cloud. ● Transit speeds in and out of the cloud are faster than ever because of UDP technologies, making the processing of massive files a reality. ● The stringent security requirements placed on cloud providers by industry and government agencies often exceed the requirements typical for in-house data centers. ● Cloud storage has been an entry point for large companies adopting the cloud. Once a media’s content is stored in the cloud, processing the content while in the cloud becomes a much more attractive option. ● Amazon remains the large storage gorilla, representing 68% of the total source location volume ingested in 2016 up from 63% in 2015. Large media and entertainment companies increasingly move mezzanine storage to Amazon’s S3, which further fuels the adoption of cloud media processing in the corresponding AWS availability zone. Figure 1. Key cloud providers and their market shares based on this survey. ● OpenStack’s object based storage, known as SWIFT, appears to have stumbled last year, dropping from 6% to 3% of cloud usage. ● Big media loves Akamai. The company’s dominance of the media and entertainment sector is no secret and their penetration of this market was confirmed by a large percentage of Encoding.com’s M&E customers using Akamai NetStorage as a destination for cloud media processing. ● A surprise to many will be that Google Cloud storage continues to struggle and has yet to break the 1% mark in the media processing market. This survey’s statistics show that Google Cloud storage does not represent a significant source or destination location for media companies who have migrated to cloud media processing. From a technical capability perspective, the Google cloud compute and storage offerings are quite competitive, but they continue to struggle to penetrate the media processing segment. Let’s look at how companies get their content to and from the cloud. Despite being less efficient, FTP/SFTP accounts for more than half the media transit in 2016 because of its legacy ubiquity. However UDP, particularly Aspera’s FASP (Fast, Adaptive, Secure, Protocol), represents a significant and growing portion of the transit data. Because of its speed and security, media managers see it as a good solution to delivering high volume broadcast content. Despite that the TCP/IP protocol was never designed for moving large files around the internet, FTP remains a popular transit protocol for getting files to the cloud, primarily due to its ease and prevalence on local media servers. Customers utilizing UDP technologies, like Aspera, saw steady growth over the last two years. The inherent speed and security of UDP make it a perfect protocol for the ingest and egress of high-value mezzanine assets to and from cloud processing centers. While there are more than 30 commercial open source encoding engines, let’s focus on the top six used at Encoding.com and each technology’s market share. 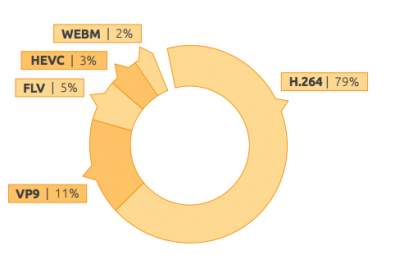 H.264 grew slightly this year reflecting its ubiquitous device and browser support. H.264 is the underlying codec within the most dominate adaptive bitrate standard HLS. Support for the VP9 codec in 2016 was followed by strong adoption and market interest as an alternative to H.264. This is especially true for high volume customers who benefit from the nearly 50% savings in data rate for the same quality when compared with H.264. VP9/DASH implementations sparked the most interest due to strong VP9 browser compatibility (~90%). However some markets remain hesitate to embrace the format because the significantly longer encoding times seen with Google’s libvpx encoding engine. Netflix ran a series of encoder tests in late 2016. From a Netflix blog post, “… x265 and libvpx demonstrate superior compression performance compared to x264, with bitrate savings reaching up to 50%. This is especially the case at the higher resolutions. While x265 outperforms libvpx for most all resolutions and quality metrics, the performance gap narrows (or even reverses) at 1080p." Figure 2. Popular video codecs and containers. While Flash is still being used for some point cases, such as online advertising and legacy browsers, its days are numbered. Flash outputs continue to decrease year over year. Many expect to see the Flash video codec disappear completely within 12 months. Flash deprecation continues with the Chrome M56 release where Flash is automatically disabled by default. After showing strong growth in 2015, HEVC as a target output codec dropped 50%, with output jobs decreasing from 6% to 3%. The 4K smart TV market remains the largest consumer of the HEVC codec. But the HEVC codec license uncertainty and a lack of mobile device compatibility is significantly inhibiting the market from further exploration of this codec. Historically, M&E companies have managed their Multichannel Video Programming Distributor (MVPD) workflows in-house using on premise encoding. This made sense when only a few output formats were needed to support Comcast, Charter, Time Warner, etc. However, much has changed. Media companies now distribute their content to an increasing number of MVPDs and virtual MVPDs (Netflix, Hulu, Amazon, iTunes, etc). Each of these distributors has its own encoding requirements. In addition, the pace of change for each distributor has accelerated as viewers demand their content be available across multiple platforms including cable STBs, OTT STBs, Apple devices and game boxes. The result has been a significant increase in M&E companies migrating traditional workflows to the cloud. Storing individual program components (video, audio, captions, meta-data) separately in the cloud enables content providers to assemble the required output flavors on the fly. No longer is it necessary to revert back to a single high-bitrate Mezzanine file each time a new version is needed. This is one of many use cases where leveraging cloud-based transcoding and packaging can power more efficient workflows. Adaptive packaging protocols serve as the industry standard for premium video publishers to improve the end user video experience across varying network conditions and a diverse set of playback devices. HLS remains the most prominent standard, primarily due to its broad compatibility with iOS and Android devices, browsers, and OTT players like Apple TV, Roku, Fire TV and Chromecast. HLS is especially popular with video publishers who require sophisticated DRM or Dynamic Ad Insertion. HLS v5 was announced in September 2016 and most notably included support for Fragmented MP4. Strong growth from OTT providers has moved DASH (Dynamic Adaptive Streaming over HTTP) ahead of MSS (Microsoft Smooth Streaming ) as the second most popular adaptive bitrate protocol according to Encoding.com statistics. A relative lack of DRM and DAI integration hinders the protocol’s expansion. Despite the industry excitement about 4K, this resolution makes up only 10% of Encoding.com’s total output. The 1080p resolution content makes up about half of the company’s output and 720p remains a leading format for most mobile devices. Figure 3. 4K resolution output represents only 10% of total output. 1080p is most prevalent for fixed displays. The audio experience remains a critical component for mobile and OTT video presentation. From low bitrate audio “fall back” streams all the way up to high bitrate surround sound living room audio are now commonplace within the same adaptive bitrate package. This ensures that the highest available experience is delivered to every device at every network speed. The use of Dolby Digital (AC3) and Dolby Digital Plus (EAC3) grew significantly last year. The 5.1 and 7.1 codecs are gaining in mobile device compatibility. The codecs are often used within the premium audio channel of the HLS spec, which allows 192kbps 5.1 streams to be paired with 1080p high-bitrate video streams. This audio video combination offers a premium experience for connected televisions, and the Apple TV and Roku boxes are often connected to home theater receivers. Figure 4. Popular encoding audio formats. The AAC and Dolby HE-AAC codecs remain popular audio codecs with broad compatibility across desktop and mobile devices. The HE-AAC codec is especially popular within the HLS adaptive bitrate standard as it performs exceptionally well at the low 64Kbs audio rate, the only bitrate required in Apple’s HLS specification. The bottom line is that cloud processing is increasingly the ‘go-to’ solution for media companies. The cloud offers secure, cost-effective and versatile program storage, coding and workflow enhancement to serve a variety of consumer devices. With all these advantages, there is less reason for a media house to purchase, maintain and staff all their storage and coding needs on site. By outsourcing such tasks to a company that specializes in these workflows, can mean increased efficiency, productivity, security and even higher profits.